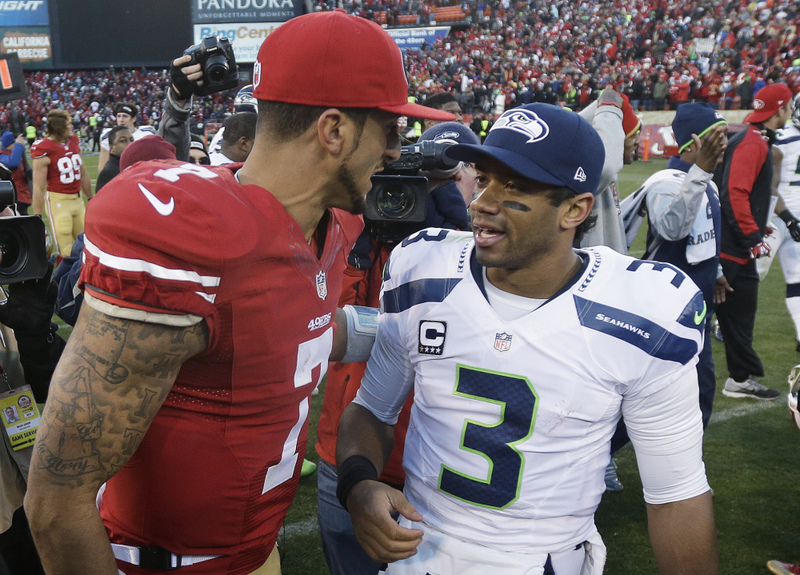 Home-field advantage is a plus for Seahawks, but 49ers are 2-0 on the road in the playoffs this year. SEATTLE — For all the noise about, well, the noise, neither the 49ers nor Seahawks have a distinct advantage for Sunday’s NFC championship game. Sure, Seattle is a difficult place to play, with the 12th Man at CenturyLink Field challenging the sound barrier with their cheering. But San Francisco is a strong road team, going 6-2 as part of a 12-4 regular season, and 2-0 in these playoffs. Certainly the Seahawks (13-4) have a superb defense, the best in the land, ranked first in points allowed, overall yards allowed and yards passing. Guess what: The 49ers are no slouches in that area, third in points surrendered and fifth in total defense. Each side excels at forcing turnovers. The Niners have a dynamic young quarterback, Colin Kaepernick, whose ability to escape pressure and ground speed epitomizes the new wave at the position. The Seahawks have Russell Wilson, who is as difficult to trap in the pocket and as creative outside it as anyone in the NFL. Seattle’s Marshawn Lynch is among the most powerful and relentless running backs in the game. So is San Francisco’s Frank Gore. San Francisco Coach Jim Harbaugh knows all about winning, whether on the college level when he was at Stanford, or in the pros. In his three seasons guiding the 49ers, they have gone to three NFC title games, winning it last year. Harbaugh doesn’t have much on Carroll, who also has overseen a turnaround of a franchise after an even more successful college stint at Southern California that includes two national championships. “They’re such a consistent football team across the board that they have many strengths,” Carroll said of the 49ers, against whom he is 2-4 since taking over the Seahawks. But two of those victories were in the past two home meetings with San Francisco. Of course, the same can be said of the Seahawks. And 49ers offensive coordinator Greg Roman obliges when he looks at the Seattle defense. “They do a great job of taking the ball away,” Roman said, noting the Seahawks’ league-high 39 takeaways, including 28 picks. San Francisco might have an edge in experience at this level, but this also is Seattle’s third visit to the postseason in four years. Maybe the All-Pro team provides a slant toward one side. Nope: San Francisco has linebacker NaVorro Bowman and Seattle has cornerback Richard Sherman and safety Earl Thomas. Special teams are experienced and heady on both clubs. Even the oddsmakers see the NFC title game as something of a toss-up. Seattle was installed as a 3-point favorite, which is usually what being at home — noisy as it is — can be worth.